I’ve tried, pretty successfully, to live a life without too much fear. Growing up I didn’t follow the rules of stranger danger. I talked to everyone I met, picked up hitchhikers, went out to unfamiliar places alone, and I’m convinced it has enriched my life. I’ve been lucky; I’ve never had anything bad happen, at least not from someone I was supposed to be afraid of. After all my biggest source of trauma has come in the form of surprise attack from someone I was in a relationship with¾not a stranger lurking behind a bush. My outgoing and trusting nature even translated to the war zone, where I was regularly reprimanded for trying to make friends with the Iraqis instead of treating them as a threat to our safety. When we were at the market or on our camp “guarding” local Iraqi workers my curiosity and desire for connection always outweighed my sense of fear and danger. 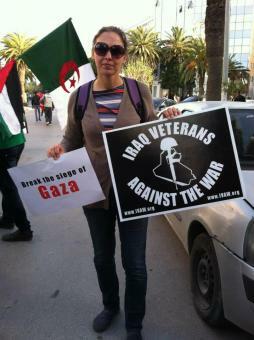 'Celebrate People's History: Iraq Veterans Against the War - Ten Years of Fighting for Justice and Peace' is a portfolio poster project honoring IVAW's ten year history of speaking out against the wars and taking action to bring home the impact of these wars. 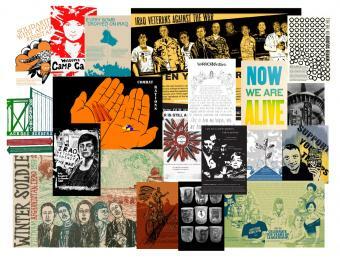 The portfolio features contributions from IVAW members, Justseeds Artists' Cooperative members, along with allied veterans, artists and writers. It highlights key ideas, moments, projects, tactics and individuals from IVAW history in order to uplift IVAW's ongoing struggle, inspire others to take action, and preserve a snapshot of movement history. Take a look at the posters at the following link. We will continue to update the section below for showings of the Portfolio. Check back here frequently. Senators, Constituents, & ISIS, Oh My!